The first time Tasken competed on the TV show The Voice of China, the Chinese version ofAmerica’s Got Talent, he didn’t get through to the second round.But the second time, he sang the song “A Lovely Rose” in Chinese. The judges were so impressed, they asked him to sing it in his native language – Kazakh. The second largest Turkic Muslim group in Xinjiang, with 1.5 million people, Kazakhs in China have a long tradition of pastoral herding between high-elevation summer pastures and lower-elevation winter pastures on the northern fringes of the Heavenly Mountains (Tian Shan). But in recent decades, a combination of state policies and the sense of lack which accompanies rapidly imposed development has radically transformed their way of life.Their rangeland was gradually seized by the Production and Construction Corps, a paramilitary established by agricultural Han in China’s border areas as land reclamation and irrigation projects were geared to secure the Chinese-Soviet frontier. This has led many Kazakhs into a more sedentary existence in government housing in small villages, and following the collapse of the Soviet Union some immigrated to Kazakhstan. By 1997 up to one-third of China’s Kazakhs had moved into Chinese cities in Xinjiang.Tasken’s biography reflects these changes. 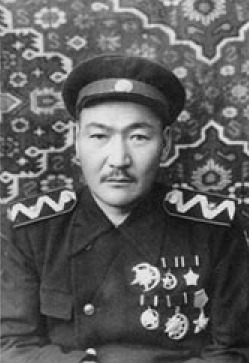 Born in Ürümchi, the capital city of Xinjiang, Tasken is the grandson of the general Dalelkhan Sugirbayev, one of the leaders of the Soviet-inspired pre-1949 “Three Districts Revolution” that established a republic in Northwest China prior to its “peaceful liberation.” His mother was the daughter of Ili Kazakh autonomous prefecture’s governor. Instead of taking advantage of his “good” family background and becoming a “guān èr dài,” a second-generation official in Ürümchi, Tasken decided to pursue his dream of becoming a musician. He moved to Beijing and went from bar to bar to try to find his way. As this clip shows, he finally found his moment when he broke through on The Voice of China. It is interesting to note the way she links up the way minority discourse operates in China and how feelings of displacement are amplified when a minor actor is relocated in the Chinese city. Both she and Tasken have moved into the urban world of the Chinese mainstream to pursue careers. In part it is the lure of money and power that accompanies having “a voice” that has made them diasporic subjects within the Chinese world. Both of them, to greater and lesser extents, have been confronted with the dilemma of “passing” as legitimate Chinese urbanites and the feelings of loneliness that confront cultural orphans in a strange land. For a few seconds on The Voice of China, music connects them, two minor players catalyze each other, and Tasken advances to the next round. Please don’t ever compare us to whites again. Hi “The Truth,” I’m not totally sure who the “us” in your statement stands for, but I think all dominant groups can be compared. To compare such groups is not the same thing as saying they are equivalent, but rather to examine the way power and privilege are distributed in different circumstances. Don’t Mind Mr theTruth above, he obviously does not speak for all of 1+ billion Han, even if he may represent a view from particular segment of the population. I believe your comparison is valid. It’s understandable that many Han people in China cannot relate to the concept of Han-privilege because they are living in it! But it really baffles me sometimes that many Chinese who are recent immigrants to the West do not make the connection between the white-privilege of their host country and their own minority status within to that of minority treatment in China.